Tree planting continues at REGUA! Our efforts in tree planting often seem staggering, but such is our ambition at REGUA. We see degraded land as a burden to the planet and certain of our argument – that there is no way to justify the destruction of tropical forests or even search for their sustainable use. Why? We do not know how they work as an ecosystem and it erases just too many life forms that depended on it. That cannot be responsibility!! Forests and the species that depend on it around the globe are suffering and at REGUA, we are trying to grow them back. Not so easy!! We are so fortunate to have friends, trustees, professors, students, volunteers, staff, community members and children that also share this view. They all want to help us help us understand how it works and help us to restore the areas devoid of forest. This hard work provides opportunities in labour for the local community but more importantly, they gain pride in creating a more beautiful place. Responsibility is shared and though there may be a minimum that see disrespect for the hard work their ancestors put into harnessing land, today their grandchildren understand that forests teem with life, biodiversity and of course, produce water. We have just capped half a million trees planted and we are very proud of our story. We are especially proud of our ground team who made it possible! Our young ranger project, now in its 13th year, continues to flourish under the ever-present influence of Prof. Carlos. From nearby schools, the youngsters are collected once a week and brought to the reserve. These young people are given the opportunity to experience life in the forest with walks and activities which bring them into a new environment. Although the majority of the subjects raised are based on environmental and conservation issues, this can follow a very wide area of experiences as they are made aware of the human responsibility and duty as a citizen, to nature and their community as they grown up. 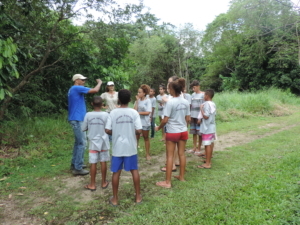 Indoor lessons on various topics including the biodiversity of the Mata Atlântica, how forests help provide clean water and the importance of recycling. Walks around the wetland area, enable practical activities, such as water quality testing, clearing the paths of fallen branches and repainting the distance markers to be carried out. Sometimes they help in the tree nursery or plant out saplings. These practical activities ensure that these young people become engaged with the forest and feel comfortable there. Researchers visiting REGUA are happy to discuss their projects – with snakes and bats being the two most popular talks so far. The children are also involved in the education programme supporting the introduction of Lowland Tapir on the reserve. 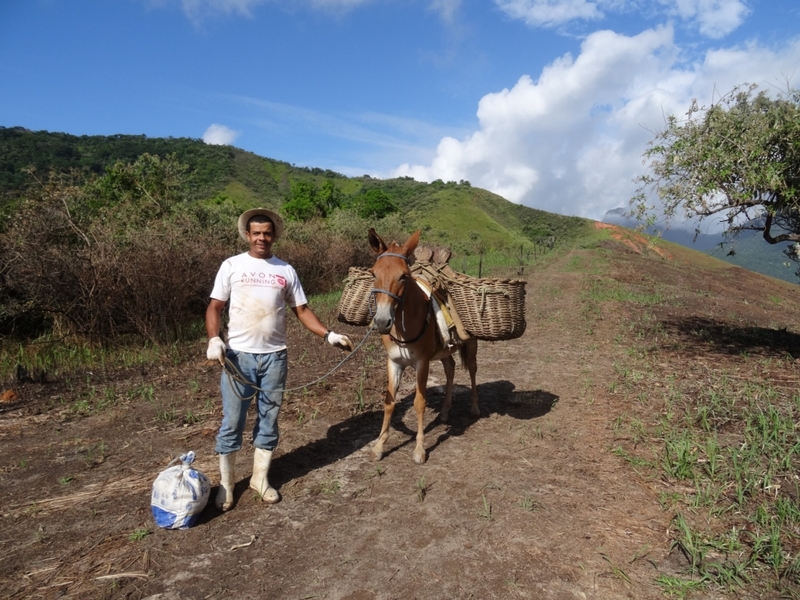 This has encompassed our local communities and reinforces the importance of improving and protecting the Guapiaçu Valley. Our Orchid House is on its way! 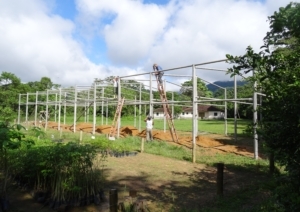 With so many orchid species to be found in the Brazilian Atlantic Rainforest, REGUA is building an Orchid House. This has been made possible with the generous support of the San Diego Orchid Society and Peter Tobias. Our aim is to show visitors some of nature’s best treasures. There are over 1,000 orchid species to be found in the Serra dos Órgãos region, a reflection of privileged growing conditions, such as the cloud forest along its mountain ridgeline. Orchids range in size, colour and perfume with the majority being arboreal but there are terrestrial species as well. David Miller and Helmut Seehawer were the first to look closely at orchids of this region and between them wrote the definitive book on the species found here. Sadly orchids are commonly known as “parasites” for people associate their living style as totally dependent on hosts for their survival. The REGUA orchid Cathedral is a miniature shaded garden which will feature examples of the many native orchids and give us the opportunity to explain their secrets to REGUA’s visitors. It will allow us to show visitors that orchids are very important and part of the ecosystem and indicate the forests are in a good state of health and biodiversity. Once the Orchid Cathedral is complete, we shall invite Rio’s Orchid Society to help us in the fun part, that of arranging the specimens to make most of their beauty. We hope our visitors will leave understanding more about these highly evolved plants which are epiphytic and not parasitic, and appreciate that they are the jewels of the forests. For more information on the book Serra does Órgãos: Its History and its Orchids, follow this link. Having children visit is what keeps REGUA going, for they are the ones that one day will inherit the responsibility of caring for this World. 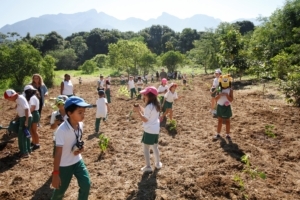 The Rio de Janeiro Miraflores bilingual school made their 7thannual visit this year, expressing their keenness to learn about Nature and helping to plant native trees. 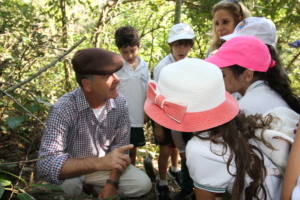 Miraflores’ School’s director Luiz makes sure that this event is given the right importance for he sees in this excursion, an activity that awakens the pupils to environmental responsibility. This year REGUA received 65 children between the age of 6 and 7, divided them into smaller groups to walk them around the reserve showing flora and fauna, from insects to reptiles and mammals to the trees growing. Being a bilingual school they demand the talking in English enjoyed by all. 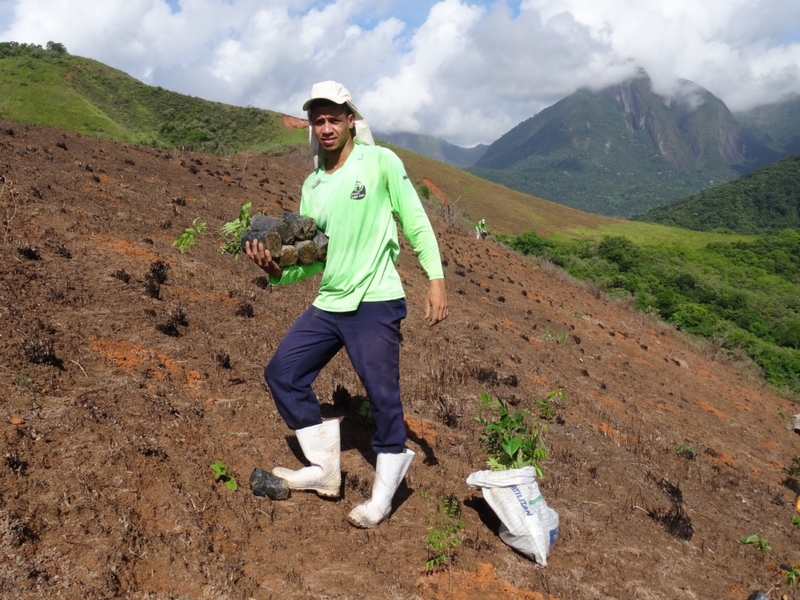 They visit the nursery, fill the individual plant bags, plant seeds and transfer seedlings to understand what is involved in the entire process to start a forest. Their walk shows that forests can be started and provide habitat for a multitude of species. They feel responsible and connected, and learn that restoration is only about effort. The school has been visiting annually since 2011 and I always remind them that they are the reason why we want to continue planting trees. It is a true privilege too offers these children the opportunity of sharing this unique experience here at REGUA. Thank you Luiz for providing the opportunity to share our work with you; your staff and your children. Gabriela Viana is a dedicated conservationist who has helped project REGUA with her knowledge, experience and dedication. Gabriela lives in the municipality of Cachoeiras de Macacu just 15 miles away from REGUA, and her professional life led her to work at the Golden Lion Tamarin project, ITPA and IBIO, all successful conservation organizations in Rio de Janeiro State. Gabriela helped REGUA develop its Agenda 21 action plan in 2005, and she always wanted to work and further conservation efforts in this municipality. When Petrobras signalled its interest to fund a project, Gabriella came to our rescue and helped write a proposal, but after two unsuccessful attempts we were less keen to submit a third. With much insistence Gabriela then suggested we focus our expertise on compounding our education and reforestation programmes, and she prepared a project based on those two lines. We were ecstatic that out of 600 projects submitted, REGUA was approved and the overall results were considered excellent by Petrobras, leading to an invitation to submit a sequel last year. REGUA then introduced an important component along with education and restoration; that of monitoring water quality engaging local school children. 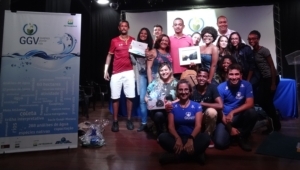 Not only was this perceived as important by Petrobras, but it sparked off a huge awareness by the local population of the importance of water quality for its towns. This led to a photographic competition that resulted in further promotion of the project. Gabriela is the personification of dedication, quality and perseverance and she was recently head-hunted by WWF to direct their “threatened” species programme. Gabriela helped put REGUA on the map and believed in the capability of her team. 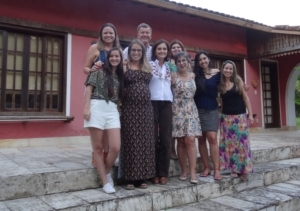 She taught us quality and style in the quest for project results that have shaped REGUA into a major player in the local Conservation world of Rio de Janeiro. A big thank-you Gabriela for the time you have dedicated to REGUA. Ants belong to the Formicidae family, one of the most important in Nature, pillars of the ecosystem. 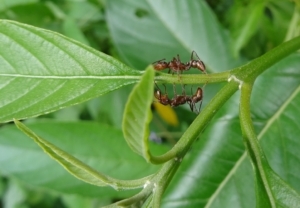 Divided into Tribes, the Atta and Acromyrmex are very common in our Neotropical forests and though we worry about their action in freshly planted forests, they are very important in the established forest harvesting and cultivating their fungus on which they feed in their underground homes. Their vast system of perfectly ventilated tunnels and chambers permits precious nitrogen to reach the roots of trees. We are trying to identify the most common species at REGUA but we expect to have between 400 and 450 different species. Taking photographs is notoriously difficult, for aside being small, they move and are often camera shy. If you want a challenge and wish to visit us spending your time helping us to get some images to help with developing a field guide, drop us a line and we would really love your company. South East Brazil’s most successful Young Ranger course has celebrated its 12th anniversary. It is aimed at the younger segment of our local communities and offers young children a glimpse into our own vision of the world, that of conservation. We want to show them why we need to protect Nature here and how we do so. If they can understand that they live in one of the most bio-diverse Hotspots in the globe and that REGUA wants to share this with them, then we have helped instil the concept of responsibility. It has been a brilliant 12 years with super results and it’s a programme that all sister conservation projects could offer. P.S. I well remember a group of friends visiting the Reserve in May 2006, agreeing to help with your new Educational project. They took telescopes down to the Wetland to meet our first group of Young Rangers. The children had never really had the opportunity to look at birds and the excitement could be heard back at the lodge as they looked at different species and delighted in trying to understand their English names. The current Young Rangers are studying and monitoring the quality of the water in the wetlands, are keen to explore the forests in the area and understand far more about the importance of protecting the area they live in. They still love to practice their English too! REGUA has just received the Federal University of Juiz de Fora and Uppsala University on a week-long workshop at REGUA as part of the International Research Council project “Greenhouse gases arising from reservoirs in Brasil”. Reservoirs providing water to hydroelectric plants have always been perceived as “green energy” but in fact this is not always the case. In partnership with Uppsala University and other partners, various doctorate and master students have worked over three years to study various reservoirs across the country to determine their long term effects and the results will help the Intergovernmental Panel on Climate Change to perhaps cast a shadow as the future of their construction. Prof. Carlos Quintanilha, the Environmental Education teacher in charge of REGUA’s Young Ranger programme has started with the weekly lessons on Thursday afternoons. There are 15 very enthusiastic youngsters coming from the nearby communities of Matumbo and Estreito. All of them attend the local school in the morning and look forward to coming to the Reserve in the afternoon. Prof. Carlos is a very dedicated teacher keeping the Young Rangers’ interest in nature with different subjects and activities which are undertaken during their visits. So far this year the Young Rangers have worked with the subject of water availability and its sustainable use. Carlos is raising their awareness on clean, abundant water being dependant on the protection of our forests. “Forests produce water” is the quote you hear them commenting amongst themselves. 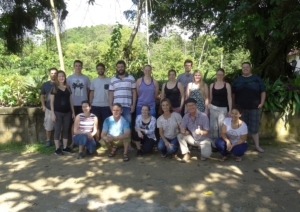 The Tapir re-introduction team comes to Regua on a weekly basis to check on the well-being of the Tapirs and to talk to community neighbours about this project. The Young Rangers were thrilled to hear from Joana the Education Officer from the Tapir Reintroduction programme, that the Tapirs are becoming more independent from the food provided for them and that they are moving further away from the release-pen as each day goes by. Prof. Carlos and the young rangers will be visiting the local villages of Guapiaçú, Santo Amaro, Areal, Matumbo and Estreito to inform the communities on the positive development of this pioneering project.